This tutorial will provide you with detailed information on the various options you have available on Botsify. NOTE: It is assumed that an account and a chatbot have been created. If not, please follow the instructions available in the tutorials section. The menu from the left side of the page is the first thing you should know about. It is designed in a vertical format and does not require much technical expertise to understand. Lets see what the menu comprises of. 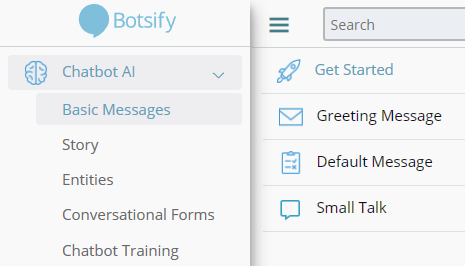 When you click here you see “Basic Messages”, “Story”, “Entities”, “Conversational Forms” and “Chatbot Training” in the dropdown. Let's have a look at each one of these, respectively. On this page, you can customize four different options, namely; set up a “Get Started” button, write your own “Greeting Message”, change the “Default Message” and enable/disable “Small Talk” settings. This page allows you to create a story or multiple stories for your chatbot. A story can be comprised of user responses or suggestions from the chatbot as per your liking. You can make it as precise and detailed as you want! Read more about stories here. This section is for managing entities. They are pre-made ‘objects’ which can be assigned various values. Such as "Favorite team" could be an entity and "France, Italy, Brazil" could be it's value. And when you use entities in your stories, your chatbot automatically detects that an entity of "Favorite team" is present in the sentence. This page allows you to create and manage forms for your chatbot which can be added to an ongoing story. For instance, you want to get a customer’s contact information within the conversation, you can simply add a customized form in your story and store it for later use. Read more about forms here. This section will help you teach your chatbot new queries from the users asked questions over time. Each time your user asks a question which the bot fails to answer, the query starts appearing in the "Chatbot Training" section. In this section you tell if the query/question which your chatbot failed to understand is a form of already presented query or entity? Or is it a story. If it's a story you go ahead and create a one and if it's an alternative form/phrase of other query/question. You just teach your chatbot without creating a story every time. Some pre-designed tools can be used to make your chatbot even more efficient. Let's find out what are they and how can you make a use of them. 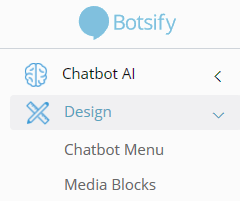 A chatbot menu is the navigation appears in the bottom left hand side of your chatbot. This is important for your chatbot experience because you can put up actions which are expected to be taken by your users most frequently over the conversation with your chatbot. Here’s a detailed tutorial for creating a chatbot menu. Media Blocks are graphical messages, such as Image, Audio, File, Video, or an Image with some call to action, or Text with some call to action. The easy designer helps you create media blocks without any learning. 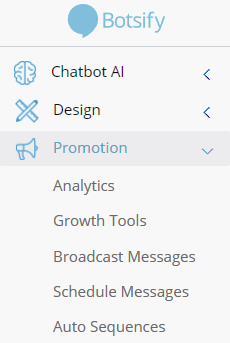 In this dropdown we have “Analytics”, “Growth Tools”, “Broadcast Messages”, “Schedule Messages” and “Auto Sequences”. Let's have a look at each one of these. Here you can view analytics on daily, monthly and overall bases of the performance. The high level stats help you understand how your chatbot is performing. You can use various options for promotion and placement of your chatbot including plugins and a direct link. This page allows you to broadcast messages to your users. Once a user converse with your chatbot you can send a broadcast message to them whenever you want. Try sending a test broadcast first to check how the message looks. This page allows you to schedule a message. For instance, you want to inform your users that your company does not operate on sundays so you can simply run a message on every Sunday that will let your audience know when you are unavailable. This section contains "Bot Users" and "User Segmentation". 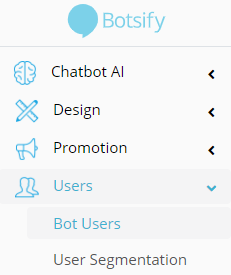 In Bot Users you can view the list of people who have interacted with your chatbot at least once. User Segmentation helps you create segments of users based on entities. Here you can view all the chats your bot did with various users. You can see questions asked by a user and the responses your bot did/didn't give. This tab allows you to change your Facebook page for your chatbot, add multiple administration to manage your chatbot and toggle switches to "Activate or Deactivate your Chatbot” and a variety of other settings. This will redirect you to Botsify’s YouTube channel where you can find amazing videos including detailed tutorials on using Botsify platform. Redirects you to our help section. This will take you to our Facebook community, where lots of people get along and drop their queries/feedback for Botsify. View and edit your current profile. This will inform you which plan you are using and you can also change it from here. You can find details of each functionality in next tutorials.